Wellness Kitchen volunteers, with check Len Smolburd – Grants Manager, Community Foundation, Nancy Walker – Founder & Executive Director. 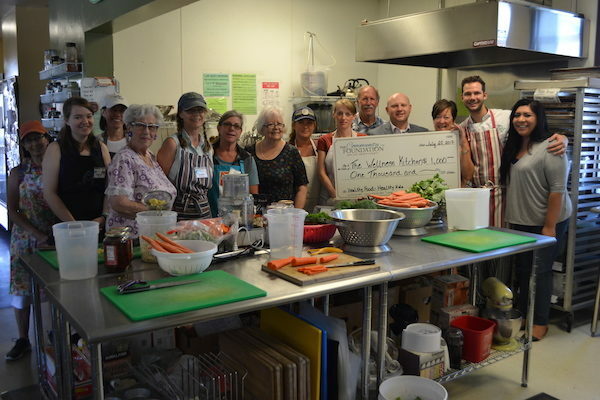 –The Wellness Kitchen and Resource Center received a $1,000 grant from the Janssen Youth & Youth Sports Fund through The Community Foundation SLO County. The funds will support a new Wellness Kitchen educational nutrition program – Healthy Food-Healthy Kids. promote the program in the schools. The Healthy Food-Healthy Kids program will allow participating kids and their parents to experience support through receiving food by the teens providing the service. The program empowers teens to be aware of the nutritional needs of children while reinforcing the value of young people as a useful resource to the community; promoting a sense of purpose and positive self-esteem. The commitment to learning includes skills in planning, decision making and the value of team work. Additionally, teens will learn how to promote their own health through helping others. For information on the food programs, classes and other support, visit www.thewkrc.org, call (805) 434-1800, or stop in 1255 Las Tablas Rd., Templeton.